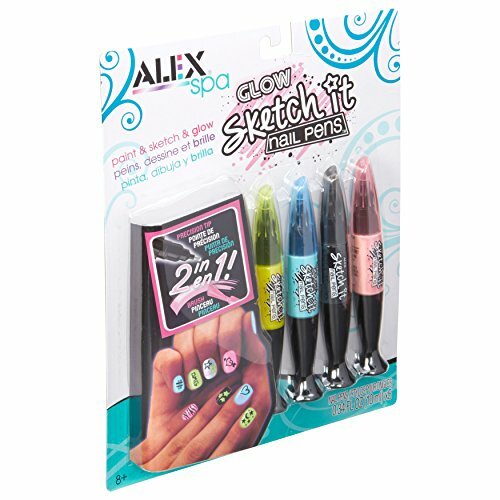 ALEX Spa Glow Sketch It Nail Penslet you express your nail art creativity day or night! The 2-tip nail polishpen has a brush on one end for painting the nail or filling in shapes and aprecision tip on the other end for sketching designs. Create long-lastingdesigns with the professional quality nail polish. See your nail art shine withglow in the dark paint colors! Includes 5 Sketch It Nail Pen colors (0.34oz/10mleach), including 3 glow in the dark, black and silver. Recommended for children8 years of age and older.